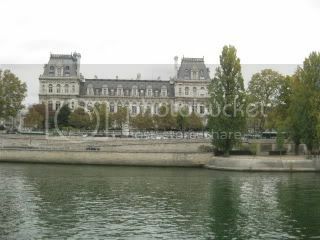 After the big lunch at La Tour d’Argent, Lynne and I walked around Paris sothat we could built good appetites for dinner. 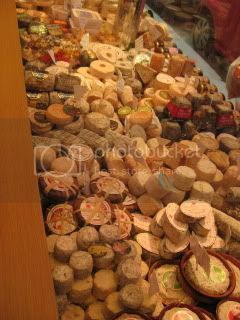 I picked up some cheeses at La Ferme Saint Aubin. 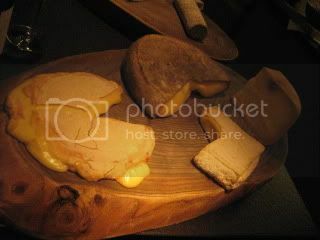 The cheese selection is great at this place. 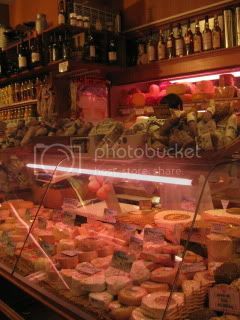 They vacuum-pack the cheese for long travel there. 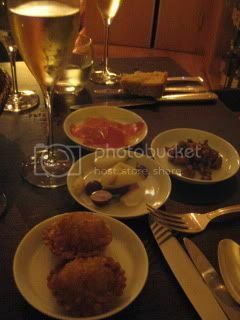 Tonight’s dinner was just two of us at SPRING (6 rue Bailleul 75001, Paris). We could luckily get a table after 4 weeks on the waiting list. 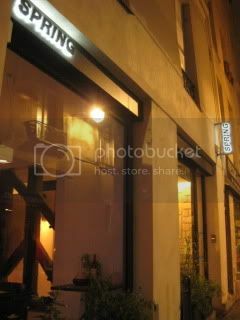 The restaurant has the ground floor (with the open kitchen) and basement. 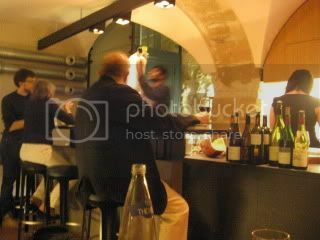 Our table was on the basement, which was a cave with short bar counter and few tables. It’s got the beautiful look and ambience. 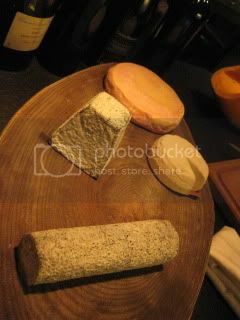 At SPRING, they serve only one kind of tasting course every night, which is created by the owner Chef Daniel Rose. 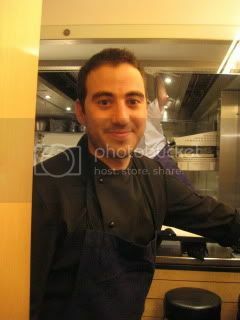 He is from Chicago and studied French cooking after moving to France 13 years ago, and opened SPRING 5 years ago. 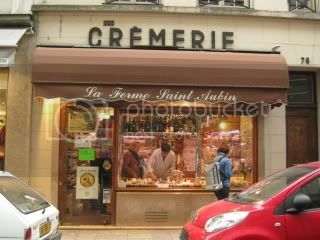 He cooks creative modern French dishes with market-fresh ingredients. We toasted with Jacques Lassaigne, Champagne Extra Brut, Blanc de Blancs, “Les Vignes de Mongueux”. Amuse-bouche…pumpkin empanada, pickled chanterelle mushrooms, radish crudite, and salami. John dory, mushrooms, with spicy chicken broth. The broth was flavored with turmeric, smoked bacon, etc. 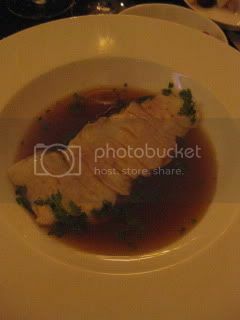 The fish had the perfect tender texture and fresh flavor. The broth was so aromatic with hint of smoke. It was really delicious. 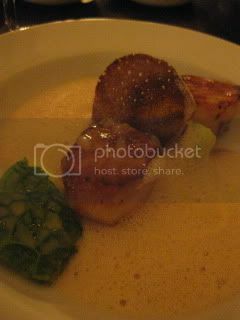 Scallops, topped with kurobuta pork lard, served in emulsion of apple cidar and cabbage…there was a paper-thin piece of clear kurobuta pork lard on top of each scallop. The flavor combination of all the ingredients was so unique and worked extremely well. So impressive. 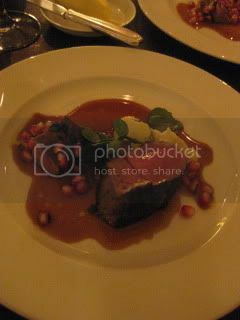 Fillet of smoked & roasted lamb with almond puree, pomegranates, and watercress. 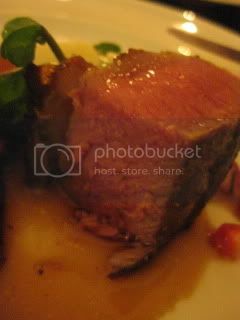 This was one of the best lamb dish I’d had. The meat was so succulent and the flavor was excellent. Wine was very nice, too. 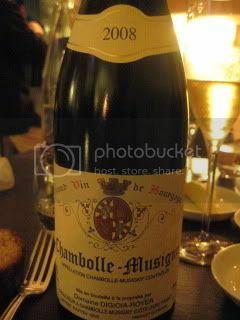 We opened 2008 Domaine Digioia-Royer, Chambolle-Musigny. It was quite rich, and almost like Vosne-Romanee kind of juicy berry flavor. Still very young, but after about 30 minutes, the wine developed more complex flavor. 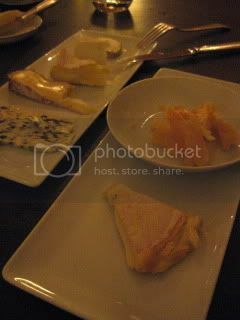 Cheese course…Mimolet, Saint-Amour de Touraine, Monte (from Loir), Pont l’Evec, Munster, Fourme d’Anbert, and REblochon. Heavenly. 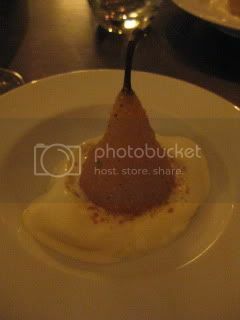 Dessert was also wonderful…Poached pair, dusted with hazelnuts, served with crème fraiche. 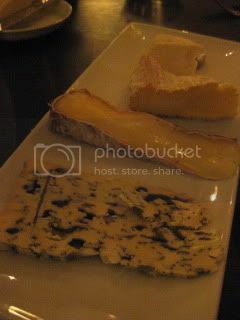 Just like the previous night, I loved EVERYTHING I ate this evening. 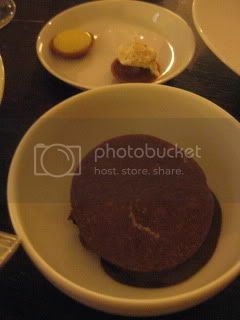 The dinner was so brilliant and I finished everything. Chef Rose came to our table and we had a nice chat for a while. He is a super talented young chef! I want to see and taste what kind of dish he would make if he cook with my Iga-yaki donabe…I wish it would happen someday!